The Best Agriculture blogs from thousands of top Agriculture blogs in our index using search and social metrics. Data will be refreshed once a week. Also check out Top Agriculture Youtube Channels list for Top videos on Agriculture. 2.2 Modern Farmer - Farm. Food. Life. Agriculture newsletter is a comprehensive summary of the day's most important blog posts and news articles from the best Agriculture websites on the web, and delivered to your email inbox each morning. To subscribe, simply provide us with your email address. About Blog Real Agriculture is focused on the issues that are impacting agriculture. Our site is focused on getting you the opinions on the issues so that you not only get the news but the insight into what the news means to your business. Whether you are a farmer, employed in industry, or government we have content that is applicable to you and your business. Facebook fans 18,432. Twitter followers 36,682. 2. Modern Farmer - Farm. Food. Life. Missouri About Blog AgWeb is your source for agriculture news online. Read the latest articles on Corn Growing, Soybean Farming, Crop Farming, and live future trading information. Facebook fans 15,434. Twitter followers 24,967. About Blog Discussion on Agricultural science and best practices. Facebook fans 1,020,727. Twitter followers 440,873. Facebook fans 33,277. Twitter followers 81,148. Rome & Bonn, also Nairobi About Blog Keeping a close eye on biodiversity in agriculture, including crops, livestock and wild relatives, for food security and sustainability. Our aim is to collect in one place anything we find on the internet that relates somehow to the notion of agricultural biodiversity. Facebook fans n/a. Twitter followers 7,976. Facebook fans 3,072. Twitter followers 4,235. Rockville, MD About Blog Agricultural research news. From fertilizers and organic farming to maximizing crops and hybridization, read about advancements in agriculture. Facebook fans 1,730,876. Twitter followers 193,192. West Lafayette, IN About Blog Purdue Agriculture is a leader in innovative learning, discovery and engagement in agriculture, food and natural resources. Facebook fans 3,389. Twitter followers 19,516. About Blog The premier online source for science news since 1996. A service of the American Association for the Advancement of Science. Facebook fans 17,558. Twitter followers 48. Hyderabad, Telangana About Blog Get an Information on Agriculture, Farming, Gardening, Livestock, Aquaculture, Horticulture, Modern Farming, and Farming Project Reports. Facebook fans 25,463. Twitter followers 102. New York City About Blog News about agriculture and farming. Commentary and archival information about agriculture and farming from The New York Times. Facebook fans 12,226,106. Twitter followers 31,215,459. Portland, Oregon About Blog Cooking Up A Story (CUPS) is an online television show offering a variety of original short form video programming that examines our food system, up close and personal. CUpS brings you unique documentary stories, talks, interviews, and leading edge agricultural information from farmers and ranchers, food artisans, and others whose lives center around sustainable food and agriculture. Facebook fans 9,633. Twitter followers 23,108. Oakland, CA About Blog The University of California Global Food Initiative aims to put the world on a path to sustainably and nutritiously feed itself. The initiative will develop and export solutions for food security, health and sustainability throughout California, the United States and the world. Facebook fans 3,766. Twitter followers 5,793. Sutton, Surrey, UK About Blog Farmers Weekly is the leading multimedia information service for farmers and agricultural businesses in print, online and face-to-face. Find Farming & Agricultural Industry News, Videos, Pictures, Blogs and Forums from Farmers Weekly Interactive. Facebook fans 106,531. Twitter followers 72,536. U.S. & Global About Blog MachineFinder is the largest, oldest and finest worldwide marketplace for used Agriculture, Residential, Construction, Golf & Turf and Forestry equipment. Facebook fans 20,488. Twitter followers 7,434. Facebook fans 1,604. Twitter followers 6,452. About Blog AGCO is the largest pure play, full-line equipment manufacturer focused exclusively on agriculture. Facebook fans 336,440. Twitter followers 37,575. Washington, DC About Blog Supporting the economic and environmental sustainability of agriculture, natural resources, and rural communities. The National Sustainable Agriculture Coalition (NSAC) is an alliance of grassroots organizations that advocates for federal policy reform to advance the sustainability of agriculture, food systems, natural resources, and rural communities. Facebook fans 69,695. Twitter followers 18,898. Ames, IA About Blog Ag Leader offers the complete package of precision farming tools from planting to harvest and from the desktop to the field. Facebook fans 5,623. Twitter followers 9,938. Sacramento About Blog The California Climate and Agriculture Network (CalCAN) is a coalition that advances policy solutions at the nexus of climate change and sustainable agriculture. Facebook fans 1,455. Twitter followers 1,021. Facebook fans 23,098. Twitter followers 1,092. USA About Blog Brownfield Ag News covers news, markets, weather and features relevant to those who live and work on farms and in rural communities in the United States, and to all with an interest in U.S. food and ag. Facebook fans 2,408. Twitter followers 20,523. About Blog ProAg is among the fastest growing crop insurance companies in the industry. We strive to serve our clients' best interests by remaining focused on our specialized line of business – crop insurance. Facebook fans 1,973. Twitter followers 1,760. Raleigh, NC About Blog The First Furrow will present the facts about North Carolina agriculture—our state’s number one economic driver—framing the issues fairly and promoting informed opinions. NCFB is a private, non-profit, grassroots organization that has been actively promoting farm and rural issues since 1936. Facebook fans 3,588. Twitter followers 1,828. United States About Blog This blog covers U.S. and global trends and developments in agriculture, food, and farming. Facebook fans n/a. Twitter followers 2,346. Canada About Blog Ag More Than Ever provides resources and a forum for agvocates to tell the real, positive story of Canadian ag. Together we can share the facts, stories and people that make our industry special. Why Ag More Than Ever? So our industry can reach its full potential and attract the people, investment and consumer confidence needed for future success. Facebook fans 22,449. Twitter followers 15,702. Facebook fans 1,324. Twitter followers n/a. United Kingdom About Blog Agrismart was established to provide leadership and a much needed innovation and change thinking to UK Agriculture. Everything we do is aimed at providing solutions to help agriculture deal with the changing times it faces whilst always putting the farmer first. Farming News is where you will find the latest farming and agricultural news available from Agrismart. Including updates and offers. Facebook fans 654. Twitter followers 330. Multi Regional About Blog Animal Agriculture in a Changing Climate fosters animal production practices that are: environmentally sound and economically viable, and that create resiliency for animal producers and their partners. Facebook fans 90. Twitter followers 175. West Des Moines, Iowa About Blog Iowa Agriculture Literacy blog is for educating Iowans on the breadth and global significance of agriculture. IALF's overall goal is to serve as a centralized resource to help increase the knowledge and awareness of today's agriculture and its importance for students. Facebook fans 1,442. Twitter followers 1,904. About Blog Leaders of In-Furrow Technology (LIFT) is your go-to source for in-furrow information and trends, brought to you by West Central. The LIFT Agriculture Blog keeps you up to date on the latest about in-furrow technology and its benefits. Saskatoon, sk About Blog SAIFood, Sustainable Agricultural Innovations and Food, is a blog space dedicated to keep you informed on current & important news, events, science, & publications on sustainability, agricultural innovations & food. SAIFood is created by the Agri-Food Innovation’s Chair at the University of Saskatchewan, Dr. Stuart Smyth, and his research team. About Blog I'm an environmental writer with a focus on food and agriculture, and commute between the Southern Caribbean (Barbados) and the Northern Caribbean (Cayman Islands). I have a Master's Degree in International Economic Policy from Columbia University and am passionate about Caribbean social, economic and environmental issues. I am intrigued by the resilience of the Small Island Developing States of the region as well as the opportunities for sustainable and regenerative growth through agriculture. Facebook fans n/a. Twitter followers 111. About Blog West Texas Livestock Growers is all about helping producers raise better animals. We provide timely issues and management tips that have the potential to affect the beef business and decision making process. The articles and tips here combine science and practical hands-on experience to provide ranchers with the information they need. Facebook fans 3,653. Twitter followers n/a. Washington, DC About Blog Promoting economic growth, agricultural development and volunteer service in the Americas. About Blog Climate Wise Agriculture shares information and experiences in order to transfer best practices and drive strategy so as to achieve climate-resilient and sustainable agricultural industries. Facebook fans 356. Twitter followers 350. Wadena, SK Canada About Blog This blog contains highlights of some of the issues facing farm families and the agriculture industry in today’s world. Facebook fans 1,841. Twitter followers 706. West Central IL About Blog Educating & advocating, BEEF, randomness, recipes, motherhood, and everything in between! Passionate about the industry that feeds the world! Facebook fans 346. Twitter followers 1,004. Michigan About Blog I am a mother, wife, millennial, dairy farmer and obviously a blogger. My husband and I live on my family’s dairy farm with our daughter Calli. We are the third generation to take over my family’s dairy farm. Facebook fans 1,422. Twitter followers 2,545. About Blog Family, farm & fun with really good grub is what you will find here. I love to share what God gave us. Bring your friends along next time. Facebook fans 5,138. Twitter followers n/a. About Blog This is an agricultural machinery website created by an experienced Agricultural Engineer with the aim of helping and advising farmers identify the right farm machinery suitable for his/her farm in order to speed up farm operations and at the same time get quality production. Facebook fans 3,189. Twitter followers n/a. About Blog The ramblings, insights and thoughts from a dairy farmer, wife, Mama; I am passionate about my lifestyle and Guernsey Ladies. Facebook fans 1,451. Twitter followers 170. Central Minnesota About Blog Raising two 6th generation Dairy Farmers. Proud to be a Dairy Farmer & DairyMom, a lot of work but always room for laughter! Facebook fans 2,194. Twitter followers 365. Facebook fans 715. Twitter followers 9,069. About Blog Above Capricorn Technologies - agricultural and environmental consultants managers focussing on agriculture, horticulture, turf, sportsturf, livestock, land and land rehabilitation, erosion management, bioremediation, phytoremediation, water/wastewater and waste management [especially organics] in the tropics. York, NE About Blog Central Valley Ag (CVA) is a member-owned farmers cooperative located in central and northeastern Nebraska. Our Mission Embracing the Cooperative Spirit to deliver value to our members Our Vision To be a world-class cooperative ensuring the long-term success of our employees and customers. Facebook fans 1,419. Twitter followers 824. Trafalgar, IN About Blog The Indiana FFA Organization is dedicated to making a positive difference in the lives of students by developing their potential for premier leadership, personal growth and career success through agricultural education. Facebook fans 7,957. Twitter followers 3,982. About Blog Get Dirty USA is an Agricultural Blog to inspire and inform people on the benefits of Agriculture and Agribusiness. Get Dirty USA strives to fill the gap between the city and the farm. We strive to bring agriculture to every side of the earth, through exciting blog post. Facebook fans n/a. Twitter followers 473. Facebook fans n/a. Twitter followers 2,083. About Blog Hi! I'm Kelly, a busy farm wife and homeschool mom. On this farm we don't have time for complicated, so these are my straight-forward, real-life adventures on a farm that grows food for your family. Climb on up and take a ride in the tractor to learn what we do everyday. Indiana About Blog I grow corn, soybeans, popcorn, and wheat with my father and grandfather in NW Indiana. Here you'll find pics from our farm and more! Facebook fans 49,310. Twitter followers 9,528. About Blog Seedstock is a sustainable agriculture blog that focuses on sustainable agriculture startups, technology, producers, food security, news and research. Facebook fans 24,963. Twitter followers 5,951. About - Farmers Weekly is the leading multimedia information service for farmers and agricultural businesses. It provide news, market prices, technical advice, opinion and a range of vital interactive services for farm businesses of all shapes and sizes. About- Leading farming website. Latest agricultural, countryside & environmental news from UK. About - Frontier Agriculture is the UK's leading crop production and grain marketing business, recognised for its close customer relationships with farmers and grain consumers and its successful management of the whole arable supply chain. About - I am expert on the CAP and the political economy of the food chain. I am also a frequent commentator for UK and international print and broadcast media and wire services on British politics, hence my new blog on the subject. 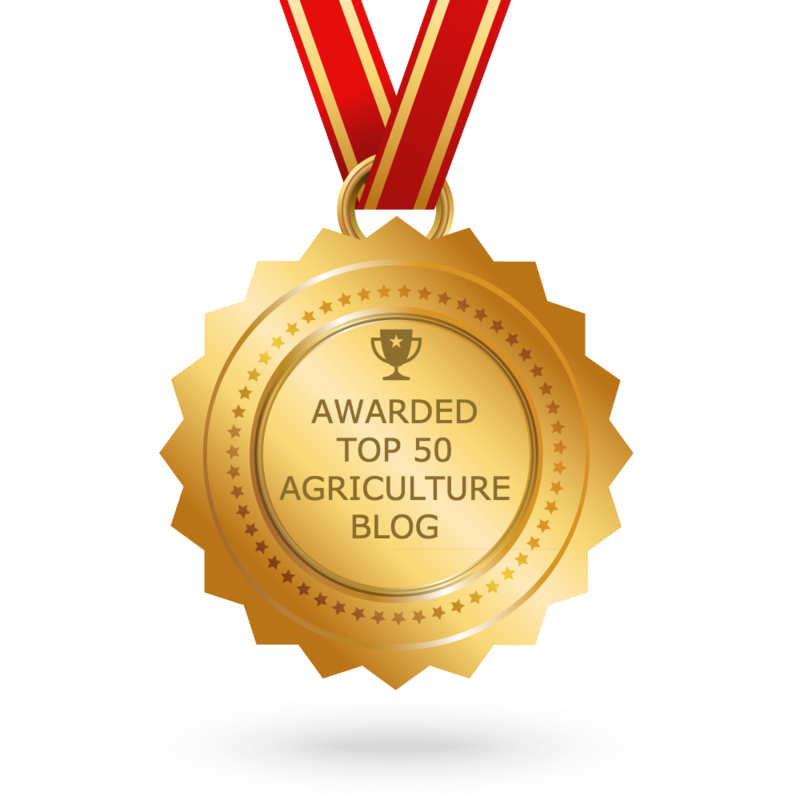 CONGRATULATIONS to every blogger that has made this Top Agriculture blogs list! This is the most comprehensive list of best Agriculture blogs on the internet and I’m honoured to have you as part of this! I personally give you a high-five and want to thank you for your contribution to this world.